Obama And Health Care: Big Hurdles Yet To Come The Obama administration has pushed through several health measures, expanding the State Children's Health Insurance Program and dedicating more than $100 billion in stimulus money to health care. 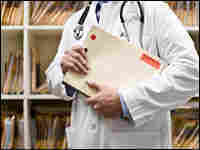 But the big test will come when Obama tries to get Congress to act on a bill overhauling the U.S. health care system. For more on Obama's first 100 days, check out NPR's scorecard. How hard is it to remake the nation's health care system? It's so hard that even if policymakers do everything right, most observers still don't give them more than a 50-50 chance of getting a bill passed. That's about the situation President Obama finds himself in 100 days into his presidency on one of his top domestic priorities. "The good news is they understand it and I think they're trying to do it in a very reasonable way," said Stuart Altman of Brandeis University, a veteran of health overhaul efforts under presidents Nixon, Carter and Clinton. "The idea that they came up with principles as opposed to a 1,300-page bill is good, and the principles are on the right track," he said, referring to the massive measure written by President Clinton's secret task force in 1993. "But I think the tough part is just hitting us, which is that if we're going to have comprehensive reform, it's going to require new money," Altman said. "In the short run, it's just not possible to save the kind of dollars that would be needed," he says, to cover the estimated 46 million Americans with no health insurance. By just about any measure, the administration can already claim several health care accomplishments since the president was sworn in Jan. 20. One of the first bills he signed was an expansion of the State Children's Health Insurance Program, adding an additional 4 million children to the 7 million current enrollees. President Bush had twice vetoed similar measures. Then, as part of the economic stimulus measure passed in February, the administration convinced Congress to include a long list of its health care priorities: $90 billion for state Medicaid programs, $25 billion to help laid-off workers continue their employer-provided health insurance, $19 billion to begin to computerize the nation's paper medical records, and just over $1 billion to study the relative effectiveness of various medical drugs, tests and treatments. That prompted the president to pronounce in his Feb. 24 speech to Congress that "already we have done more to advance the cause of health care reform in the last 30 days than we have in the last decade." Perhaps more importantly, though, the president made it clear in that speech that he is keeping the pressure on, despite calls to put health on the back burner until the economy is more under control. "Let there be no doubt: Health care reform cannot wait, it must not wait and it will not wait another year," he said. Just days later, Obama called a health care "summit" at the White House, bringing together not only Democrats and Republicans from Capitol Hill, but also representatives from health care provider groups, the insurance industry, business and labor. The summit drew praise even from those with serious philosophical disagreements with the administration's approach to health care, like Grace-Marie Turner of the Galen Institute, which advocates for less government involvement in health care. She says the summit is still generating "a lot of positive feedback" from the administration's "bringing so many different players to the table." Those who support the president's goals are positively gushing. "I would give President Obama an A-plus," said Ron Pollack of the consumer advocacy group Families USA. He says what this president has really done well is get the debate off to a quick start. That's a marked contrast to President Clinton, he says, "who did not give a speech on health care reform until September of 1993 and did not introduce his proposal until November of 1993." Yet despite ambitious timetables issued by leaders in Congress and promises from Republicans to try to reach bipartisan agreements, even big boosters like Pollack remain wary. "It's a very heavy lift to pass meaningful health care reform," he said. One big reason is what Turner calls the "80-20 rule." The idea is that most of the public and health care interest groups are willing to go along with 80 percent of the agenda, she says. But 20 percent of the agenda, they simply can't live with. "And the problem they've got is everyone's got a different 20 percent," she says. That means that while employers might be perfectly happy with a health reform plan that includes an option run by the government, they won't stand for a requirement that all employers offer their workers coverage. And health care providers like doctors and hospitals might be fine with an "employer mandate," but they would vehemently oppose a government-run plan that would likely mean lower pay. So while the administration has made a lot of progress in its first 100 days, Turner says, "I do think the rubber's about to hit the road in how they're actually going to get to the details of some much more controversial pieces of this health care reform. So the second 100 days is going to be particularly interesting."